Elise Pittenger, cello, is a proud Baltimore native. She enjoys a dynamic career as an educator, orchestral player, chamber musician, and advocate for new music. After completing doctoral work at McGill University (Canada), she moved to Brazil in 2010 to join the Philharmonic Orchestra of Minas Gerais, where she served as principal cello from 2011 to July 2015. Elise performs frequently with pianist Gustavo Carvalho, as well as her husband and duo partner, percussionist Fernando Rocha, with whom she actively collaborates with composers in Brazil and the United States. At McGill Elise worked under the supervision of cellist Matt Haimovitz; she also holds and a master’s degree from Rice University (USA), where she studied with Norman Fischer, and a BA in literature from Yale University (USA). 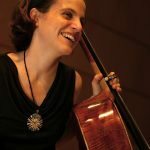 She is a devoted teacher and spent two years as the resident cellist of Music Haven, an organization dedicated to bringing music lessons to underserved communities in New Haven, CT, through music lessons and a string quartet residency. Currently Elise is the cello professor at the Federal University of Minas Gerais (UFMG) in Belo Horizonte, Brazil.